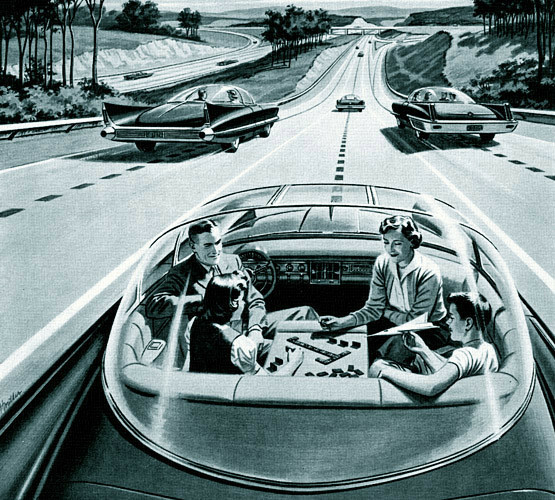 America’s Power Companies’ advertisement from 1956 depicting a future with autonomous cars. It’s 7:30 AM on a Wednesday and you’re on your way to work. You grab your briefcase, leave your house, and step into your car. You press a button and speak: “Okay Herbie, take me to the office”. Your car tracks a route, taking into account which roads will have heavy traffic, and backs out of your driveway. In the back seat - there is no driver’s seat - you have time to prepare your documents, drink your morning coffee or browse Reddit as Herbie drives itself - safely, defensively and at the exact speed limit - to your office. For decades, this was pure science fiction, but self-driving cars are beginning to enter the sphere of science fact. With Google, Tesla, and others actively working on their development, we could start seeing them in our driveways as soon as 2025. But driverless vehicles have a history that begins long before Google and a future that involves difficult legislation, extensive testing and a fascinating cultural shift. The first driverless cars were prototyped as early as the 1920s, although these were not the self-contained autonomous vehicles we see today. Although they nominally lacked a “driver”, these vehicles relied heavily on specialized external inputs. A very early model was created by Houdina Radio Control in 1925, as a demonstration of the potential of radio technology, and was controlled by a second car following close behind. 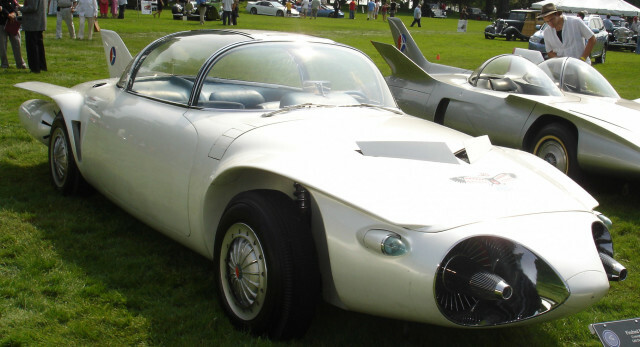 The prototype was exhibited on the roads of New York and Milwaukee, dubbed the “American Wonder” or “Phantom Auto”. By the 1950s, electrical impulses were the preferred method of remote driving, with the development by RCA Labs of detector circuits embedded into roadways in Lincoln, Nebraska and Princeton, New Jersey. The sensors were able to detect the location and velocity of other vehicles and provide guiding information to autonomous cars. Receivers for this system were built into the 1956 GM Firebird II, displaying confidence that these roadways would soon become increasingly widespread. Ambitious development of this idea continued into the 1960s, including projects by Ohio State University, the US Bureau of Public Roads, and the Bendix Corporation. All of these projects involved electronic roadways designed to provide remote input to a driverless car. In the UK, the Transport and Road Research Laboratory also conducted “drive-by-wire” research, developing cars that could move at 130 km/h over a track in Crowthorne by 1969. The autonomous vehicle was steadier than a human driver in trials, and reports predicted that the technology could prevent 40 percent of road accidents. Despite these claims, however, electronic roadways never became sufficiently widespread to allow public adoption of this type of driverless car. Around this time, self-contained autonomous systems began to exist in the form of function-specific automation. Cruise control was introduced in the 1958 Imperial, allowing vehicles to maintain speed without driver input. In 1971, Anti-Lock Braking Systems (ABS) were first implemented in automobiles, again in the Imperial, after being used in aircraft since 1929. The Sure-Brake System was able to monitor wheel speed, analyze this data to detect skidding, and relay commands to a hydraulic modulator, in the same automation model which would be used in countless applications, including autonomous driving. These automated systems place vehicles in Level 1 of the NHTSA classification system for autonomous vehicles. Also being developed during the 60s and 70s was the Stanford Cart. Initially a moon rover project, the Stanford Cart team pioneered the video processing technology which would later be used to provide input to autonomous vehicles. Equipped with a swiveling television camera, the rover would process images for ten to fifteen minutes each time it moved one metre. This enabled it to navigate slowly around obstacles without any human input. In 1979, the Stanford Cart autonomously crossed a room crowded with chairs in about five hours. These separate avenues - driverless cars requiring special inputs, function-specific autonomous systems and video processing algorithms for unmanned navigation - soon began to converge. The late 1970s to 1980s saw the first autonomous cars of the type we know today: self-contained vehicles equipped with the necessary sensors, processors, and outputs to theoretically drive themselves through typical traffic without special external inputs. Ernst Dickmanns, a pioneer of autonomous cars and a professor at Bundeswehr University, led a team in outfitting a Mercedes-Benz van to become just this. The van was able to process visual input from cameras and provide commands to the steering wheel, throttle, and brakes, driving at speeds up to 96 km/h. This was achieved using innovative “4D Vision” techniques, which involved extracting edges from an image and analyzing them while taking into account the time delay. Again, government organizations invested in this new technology, which held the potential for safer and more lawful roadways. The EUREKA PROMETHEUS project, in which Dickmanns was a participant, was the largest of these initiatives. In 1995, the project culminated in a nearly 2000-km drive at up to 130 km/h, almost completely autonomously, by Dickmanns’s VaMP autonomous vehicle. In the United States, the DARPA Autonomous Land Vehicle (ALV) project produced vehicles directed by combinations of LIDAR, computer vision, and artificial neural networks. Long-distance semi-autonomous automotive journeys were also undertaken by Carnegie Mellon University and the University of Parma. Founded in 2004, the DARPA Grand Challenge incentivised autonomous car development by offering $1 million to the team whose robotic vehicle could successfully navigate an obstacle course. No competitor was successful in completing the inaugural challenge; however, in 2005 five vehicles completed the race for a first prize of $2 million. The first place winner of these successful competitors was Stanley, a vehicle designed by Stanford University and Volkswagen, using technology adapted from the Stanford Cart. In 2007, the course was changed to an urban setting, requiring competitors to integrate with traffic. Six teams completed this challenge, headed by Carnegie Mellon’s Tartan Racing with Stanford and Virginia Tech’s entrants following close behind. Other competitors, however, were involved in accidents - the MIT and Braunschweig entrants collided, and another competitor set itself on a course to collide with a pillar. This event gave rise to the predictive and decision-making software required for autonomous vehicles to operate amongst other traffic - as well as public awareness of the mistakes this software can make. In the last ten years, autonomous car research has continued to shift from universities to manufacturers, as companies including BMW, Volkswagen, and GM have begun testing their own self-driving vehicles. Academic research has continued at the University of Parma, Karlsruhle Institute of Technology, and France’s Induct Technology. However, the most well-known - and perhaps the most advanced - of these projects is the Google Self-Driving Car project, initiated in 2009. Google’s self-driving cars include retrofitted Lexus, Audi, and Toyota models, as well as this in-house design. The Google team includes leading members of winning DARPA challenge teams. Its software combines LIDAR and Google Maps data in order to recognize its location, then uses visual input and radar to detect and identify vehicles, pedestrians, and objects in its vicinity. This data is processed in order to plan a safe trajectory for the vehicle, taking advantage of powerful contemporary computers. The aim is to emulate the behavior of an ideal human driver. 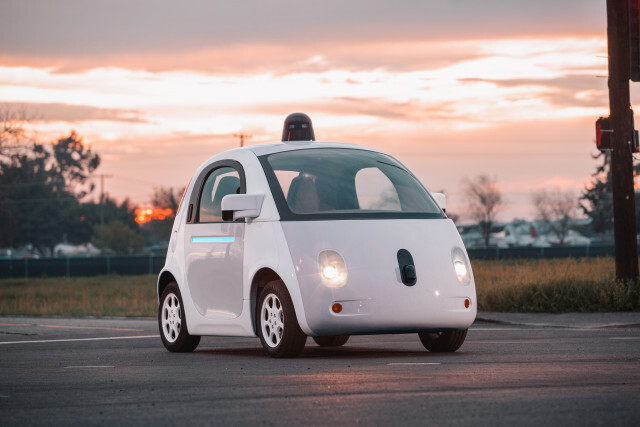 Google's vehicles are nearly fully autonomous, and Tesla’s require only minimal input, yet they are still never without a human in the driver’s seat in order to meet safety requirements. With the most reliable automation we’ve ever had, the next step is to ensure that no human driver is needed. As of 2016, Google’s cars have a collective 75 years of driving experience, and Tesla’s over 47 million miles driven on autopilot. While several accidents have occurred, including one fatal incident involving a Tesla, the safety in comparison to human drivers is notable. Elon Musk claims accident rates are 50% lower. However, a RAND study shows that test driving alone may not be sufficient to prove reliability to the confidence required for legislation, opening a new design space for modeling and simulation research. Aside from theoretically preventing accidents, the removal of the need for human drivers would open doors for the disabled, the elderly and those otherwise unable to drive. In many places, access to a vehicle is not a privilege but a necessity and an automated chauffeur can provide independence to those who truly need it. 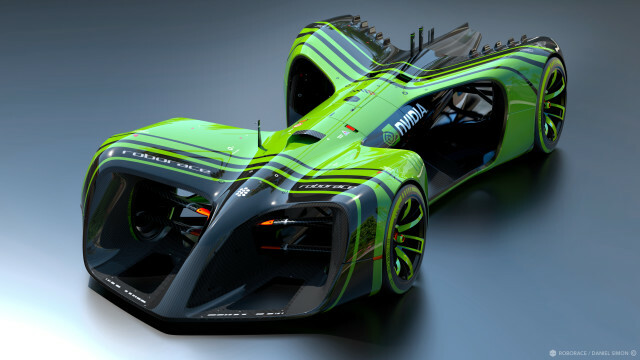 In more ambitious proposals, NVIDIA has designed an autonomous motorsport vehicle, intended to compete in the upcoming Kinetik Roborace. The DARPA Grand Challenge has continued to incite development in the fields of autonomous humanoid robotics, with its Robotics Challenge beginning in 2012 and defense vehicles with the 2013 FANG Challenge. The multinational i-GAME project has been developing technology since 2013 for communication between vehicles and with infrastructure to provide better information to autonomous driving systems, hearkening back to the “smart road” concept of the 20th century. On a smaller scale, Toyota and Uber have announced a partnership for ridesharing, as have GM and Lyft. Startups like comma.ai - led by hacker George Hotz, whose homemade autonomous Acura aims to beat the Tesla Model S - are entering the space, hoping to compete with the big players. Hopping on the Highway with Self-Driving Vehicles Nearly every major auto maker is actively planning to enter the autonomous vehicle scene. GM is expanding its Canadian research division to focus on autonomous vehicle technology, and hopes to include autonomous controls in its 2017 Bolt. GM also plans to include its hands-free Super Cruise in the 2017 Cadillac CT6. Ford has partnered with Velodyne LIDAR to develop cars that can handle a variety of adverse conditions, as well as partnering with smaller companies in order to create a product “accessible to the masses and truly enhancing customers’ lives” according to Ford President and CEO Mark Fields. Technical leader Jim McBride estimates that the necessary technology will be available by 2021. Active Park Assist technology has also been available in Ford vehicles since 2013, using multiple sensors to autonomously park the vehicle without a driver inside. BMW’s autonomous i NEXT is planned for a 2021 launch as well. Honda’s near-fully autonomous vehicle is slated for 2020. Volvo plans to launch 100 self-driving vehicles to customers even earlier, in 2017. VW’s Johann Jurgwirth claims autonomous cars will be “commonplace” by 2025 - though the extent to which these are “fully” autonomous is unclear. Forecaster IHS Automotive estimates that 76 million vehicles with “some level of autonomy” will be sold by 2035. As the prospect of driverless roads becomes ever more concrete the community around self-driving cars has grown. Enthusiasts rally around optimistic news, while detractors hope that human-driven cars - along with manual transmissions - are here to stay. The vehicles have been the subject of popular TED talks, online forum discussion, and an endorsement from webcomics artist The Oatmeal. Self-driving cars have become a household topic - and, perhaps soon, a household possession. The next steps to this dream involve legal hurdles, further testing and development, and new ways of looking at things. While autonomous vehicles have been predicted as “coming soon” since the 1950s, they again seem to be just on the horizon. Backed by the automotive industry as well as technological giants, the future of self driving cars looks brighter than ever. For more on self-driving cars, check out our feature on the technology to put self-driving cars on the road.